When it comes to hair trends this fall and winter, it’s all about the 1970s. “Yes, the long hair, which never fades, is coming back with a centre part and it’s sort of that dishevelled I-just-got-out-of-bed look,” says stylist Mika Ozeki Saunderson of Yoko’s Haute Coiffure. Braids are also huge this season, and the ombre treatment — that faux grown-out dye job look that started showing up on Hollywood red carpets a couple of years ago — is still in high demand. When it comes to colour, fast-forward from the ’70s to the ’90s and look for shades that would have complemented the Doc Martens and ripped jeans of the grunge era. “The light pastels — pinks, lavender,” Ozeki Saunderson says. “Grey is very much in. The young generation want to have grey hair,” she adds. These are all trends she saw at the Vidal Sassoon Academy in San Francisco last month. She and her mom Yoko (also a stylist at their family-run salon) attend the academy twice a year to brush up on their techniques and learn the latest in styles and products. 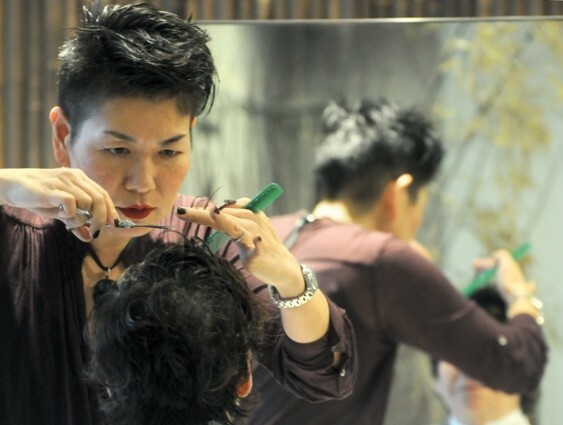 Yoko’s Haute Coiffure has carried its “architecture on the head” hair philosophy over to its new Lower Lonsdale location. After 35 years in the same Ambleside shop, the forthcoming Grosvenor condo development meant they had to find a new home. The salon re-opened in Pinnacle Hotel at the Pier earlier this year. “We went with a modern Japanese concept with bamboos and the eco concept of everything being recycled and sustainable,” Ozeki Saunderson says of the interior design, adding that the business remains a member of Green Circle Salons. Pops of green and red break up the muted grey and silver colour scheme, she adds, and a faux concrete finish has transformed an awkwardly positioned ventilation column into an industrial-chic focal point. Yoko’s is located at #1-119 E. Esplanade, North Vancouver.